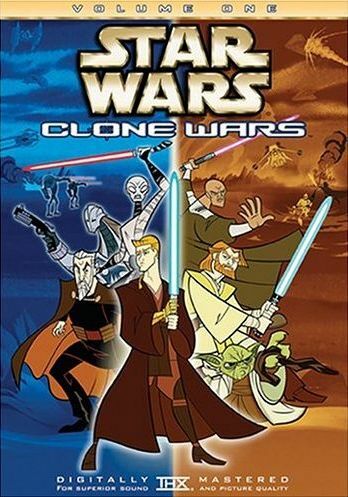 This cartoon is set in the timespace of three years, in between Episode 2: Attack of the Clones and Episode 3: Revenge of the Sith . A civil war is raging between the Galactic Republic and the Confederacy of Independent Systems, with the Jedi Knights on the side of the Republic, and the Sith Lord Count Dooku, a.k.a. Darth Tyrannis, leading the Separatists. However, the leader of the Republic, Grand Chancellor Palpatine is actually the Sith Lord Darth Sidious, and is manipulating both sides in a grand plan that will plunge the galaxy into darkness. Seasons one and two of this series, which was first released in 2003, were of three minutes each, and focus mostly on action-based battles. Season three, however, were episodes of fifteen minutes, and concentrate on the trials of Anakin Skywalker as he is dealing with his personal demons... demons that would eventually lead to his fall from grace as Darth Vader.